Won’t the far right and right wing generally gain from a “Brexit”? Many working class and young people will vote “Remain” because of an understandable fear that a “Leave” vote would mainly benefit UKIP (United Kingdom Independence Party) and lead to a strengthening of racism and anti-immigrant sentiment and policies. But right wing forces like UKIP have gained ground and has been expressing its racist politics while the UK is in the EU. The status quo is clearly not working to combat this. In fact, the racist policies of the EU – which continues to deport thousands of refugees from Greece to Turkey – are contributing to gains for the far-right across Europe. The ground for UKIP to grow is provided not by Brexit but by vicious austerity, repulsion towards the political establishment and a deep desire for working class people to take control of their own lives and have the chance of a different type of society. They can be defeated by building a strong, united movement against austerity which could cut across racial division and bring about real change in the lives of working class people. Why would such a movement opt to give a vote of confidence to an institution that is fundamentally opposed to these aims? Will leaving the EU undermine the peace process? Like in the recent Scottish Independence referendum, the approach of the establishment has been to unleash “Project Fear.” This is reflected in claims that leaving the EU would undermine the ‘peace process’ in Northern Ireland’. This has been the argued by Peter Mandelson, Enda Kenny and Martin McGuiness, but it is simply not credible. 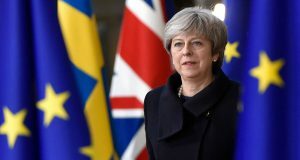 A ‘Brexit’ will not mean a “hard border” between the North and the South, nor does leaving the EU mean the scrapping of the Human Rights Act, which is not connected to EU membership. The truth is that the “peace process” is based on institutionalising and maintaining sectarian division, rather than breaking down the barriers between our communities. 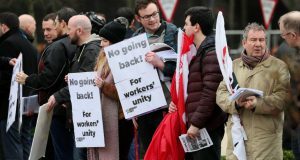 While Orange and Green politicians routinely intervene to sectarianise issues, including this referendum, working class people have historically mobilised to prevent a return to conflict. That is the only power we can rely upon, not the EU or any other outside force. Yes, but there is nothing genuinely internationalist about the EU. What was internationalist about the EU’s role in Greece? Where is its internationalism when refugees are left to drown in the Mediterranean? The solidarity and internationalism we need is constrained by the EU. Socialists stand for building a different type of Europe – a socialist Europe run by and for the millions, not the millionaires. A Europe of this kind will not be achieved from within the bosses’ EU but by building united movements of workers and young people across the continent in opposition to austerity policies – whether from Brussels or national governments – and attacks from the bosses.